I come from a small town outside of the greater Toronto area where I couldn’t be open about who I truly am. There were no spaces that were created by people like me, no rainbow flags, no queer party nights – nothing. When I decided to move to Hamilton for school, I knew that with coming to a large city, I would be exposed to a different aspect of the LGBTQ2S+ community and be amongst people with whom I could be my true self. Fast forward to two years later, I have found spaces in Hamilton where I could be myself and thrive in my own self-discovery, social life and the committed relationship I’m in. I have realized that although Hamilton might not have a designated “gay village”, there are spots that have made me feel welcomed. At first glance, these spaces may appear “ordinary”, but through my interactions and experiences I’ve found that these spaces greet you with a sense of community, set the scene for fond memories and ultimately aid personal growth. I want to share these spaces with people who might feel like they are out of their element in this city. I know it has helped me a lot during this past year and hopefully it will help you find what you are looking for. A popular locally-sourced restaurant in Hamilton, HAMBRGR boasts a wide-selection of burgers and craft beers in an industrialized atmosphere. This was not my first time at HAMBRGR, and although my date and I had to wait thirty minutes to be seated, we knew the food was well worth it. Our waiter was really friendly, giving us his enthusiastic recommendations on the extensive menu. Through his charismatic attitude, he made us feel very welcome and even tried his best to charm us. This experience is one of my first and favourite memories with my boyfriend. I felt like the space allowed me to be my true self without having to worry about how others would perceive me and my sexuality. There was no shade thrown my way that night. If I’m not comfortable in my own skin, then I can’t enjoy my time because my mind is so preoccupied worrying about everything and everyone around me. I can confidently say that I enjoyed my night at HAMBRGR because I was able to leave all the worry behind. In this queer-friendly space, I was able to focus on what was most important to me; starting a new relationship. Through writing for the Silhouette, I’ve been able to meet a lot of interesting people in Hamilton and I’ve made quite a few friends. 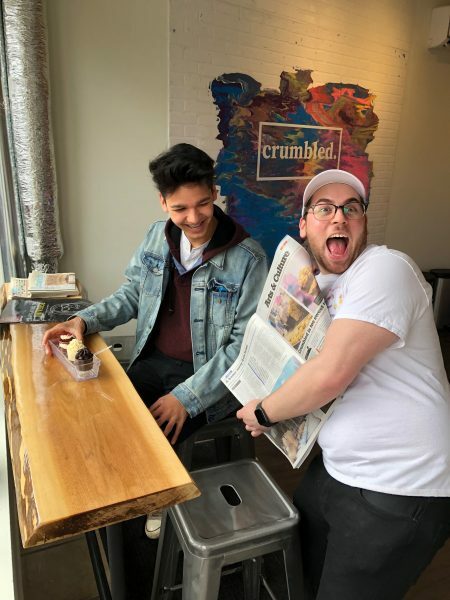 I recently befriended Dom Pugliese, who is the the owner of Crumbled. At Crumbled, Pugliese creates deconstructed cake in a cup with unconventional flavours such as lemon meringue, cookie dough and snickers. I have found myself going to Crumbled at least once every two weeks and spending at least an hour talking to Dom and indulging on his decadent cake. When I first approached Crumbled, I had no idea that it would be queer-friendly. 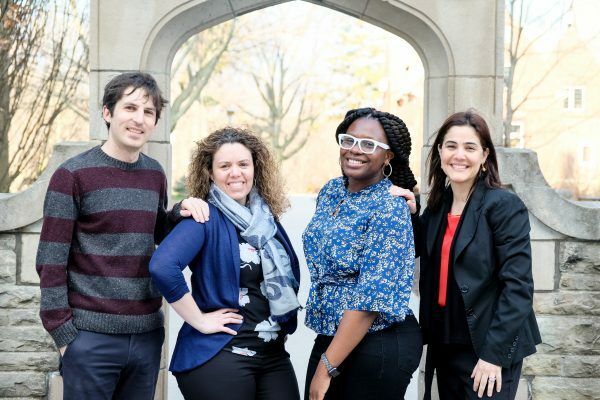 When I went inside and starting talking to Pugliese, he filled the space with inclusivity. Pugliese and I have lost track of time talking about everything from his business, to our personal lives and swapping little anecdotes. 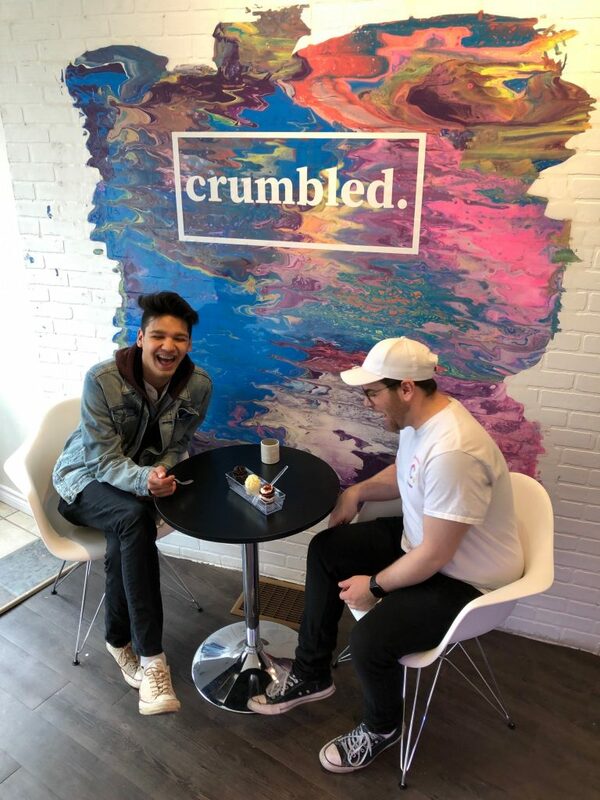 At Crumbled and with Pugliese, I was able to destress by getting lost in our conversations and forgetting the responsibilities that constantly dominate my life for a little while. Pugliese and other owners in the heart of Barton Village are working towards making Hamilton a more queer-friendly city and inclusive for all. 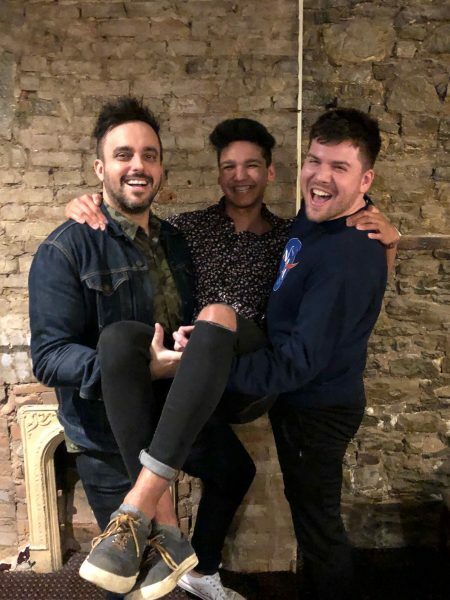 Through Crumbled, Pugliese is making an effort to add to the city’s overall queerness, and he has realized that you do not need to open up a designated space to still be welcoming to all. I always look forward to my visits to the Barton Village because I know that I have a good friend there waiting to chat over a unique bowl of cake. As a student and part-time barista, I will be the first to say that I am addicted to caffeine. I am constantly on the hunt for great lattes in environments that are both aesthetically pleasing and welcoming. During this last year, I have found myself constantly going to two cafes that fit my criteria. Redchurch Cafe not only serves coffee but also baked goods, food and alcohol. I was first introduced to this space on the night of Halloween, when the space was transformed to host live music and cocktails. I attended the party with my boyfriend and felt that I didn’t need to hide the fact that we were dating because everyone, from the staff to other attendees, had such a care-free and welcoming attitude. I was able enjoy the party without stressing about our safety. These warm and inviting feelings carried over to when I would go to the cafe during the day to study. Typically flying a pride flag outside, I would probably say that Emerald Coffee Co. is the only definitive queer coffee shop in the city, most likely thanks to the owner, Phil Green. Much like the other business owners on Barton Street East, Green is dedicated to ensuring that the queer community has a place to feel welcomed and supported. He feels that Barton Village will most likely be Hamilton’s next gay village. 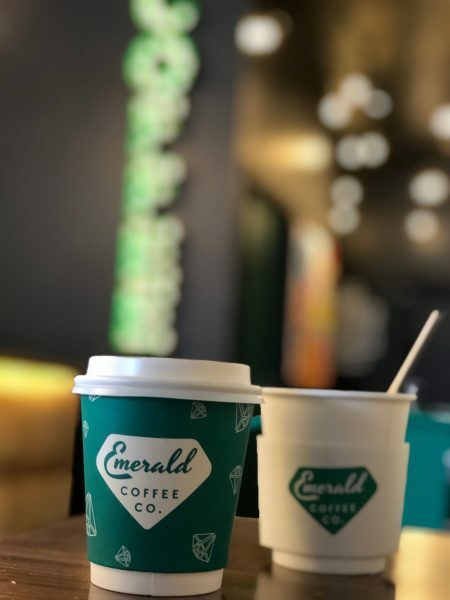 Emerald Coffee Co. is the perfect place to get some work done in a welcoming environment with great all-natural lattes, drip coffee, and cold-brew on tap. I love coming here because I really enjoy the quality you can get and I’m all for supporting queer business owners. This party planning duo is ensuring that Hamilton’s queer community always has a safe and fun space to party the night away. Adam George and Steve Hilliard have thrown massive queer parties to reunite a community that has been disconnected in recent years. They’ve also hosted former RuPaul’s Drag Race contestants and local drag queens. Adam and Steve’s parties are one of the closest thing the queer community can get to a designated queer space in Hamilton. Since meeting the duo, they have shown me that Hamilton’s gay culture does exist. I used to think that the only way I could express myself and find acceptable is by going to Toronto’s gay village, but thanks to people like Adam and Steve, queer-culture is being normalized again in Hamilton. Thank you Adam and Steve for giving me a space where I can be truly myself, unapologetically.